Just because some people are fueled by drama doesn't mean you have to attend the performance. DRAMA: You say you hate it, so why do you create it? You say you don't need it, yet you continue to feed it! Drama doesn't just walk into your life out of nowhere, you either create it, invite it, or associate with people that bring it. 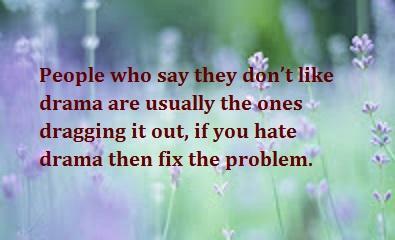 People who say they dont like drama are usually the ones dragging it out, if you hate drama then fix the problem. It's ironic that the people who complain about drama are the ones who fuel the fire with it; Simple solution to drama - keep your mouth shut! If you're tired of drama in your life, just quit being the actor. There's no crying in Twitter, that's why you have a Facebook account. 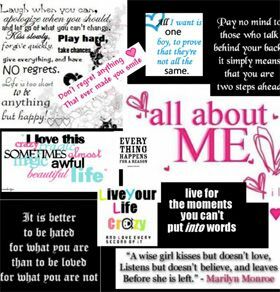 Drama is a situation girls create themselves, based on jealousy. When certain people bring nothing but drama to the table...you know it's time to let them eat by themselves. Taylor Swift waved at a boy yesterday and he didn't wave back...So she will have a new album coming out tomorrow.